Forest Highway 10 stretches from Yakutat, to the Dangerous River (29 miles), crossing the famous Situk River (pronounced see-tuk) at the Nine Mile Bridge. Most effort at this access point targets the spring steelhead and Dolly Varden fisheries. This is also the drop-off point for anglers floating the Situk River, a popular 13.5 mile trip. 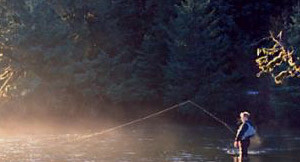 Many anglers fish seasonally for steelhead, and coho and king salmon near the mouth of the Situk River.